Nearly every fan of this soupy meal swears by their own take and preference on how chili should be made. Some even incorporate a secret ingredient into the mix. Finding the perfect recipe for chili starts with lining up the ideal ingredients. The heart of any chili dish, meat provides the base for any soup.The first chili recipe was used by Texas cowboys in the 1840s. The men would pound beef fat and dried beef with chili peppers and salt. They would then boil the concoction together for food on the trail. Many chili recipes use hamburger or ground chuck, but other styles are also popular. One blue ribbon winner at a chili cook-off took home the $20,000 prize by blending two and a half pounds of lean ground chuck with a pound of ground lean pork. Other people use deer meat, especially during deer hunting season. Vegetarians do not have to feel left out at the dinner table. Many vegetarian chili recipes implement meatless ingredients like soy burger substitute and wheat. Others play up the beans, cooking up a variety of bean types for additional flavors. Tomatoes pack a prominent punch in chili recipes. The best mouth-watering varieties would be lacking without the tomato sauce that holds all the other ingredients together. Many recipes use tomato sauce, diced tomatoes or tomato juice as a foundation ingredient for the chili. Add salsa to give your chili an extra spicy tomato kick. Some like it hot while others prefer the medium variety. Chili is one of the few meals that has the potential to satisfy anyone’s taste bud level. What spices you use depends on the desired effect. Chili powder, cayenne pepper and even black pepper give more kick to each bite. Other recipes splurge on a dash of hot sauce into the chili mix. Use as little or as much as you like, and taste for preference. Because chili is such a deeply personal dish, the most important ingredient is one you add yourself. Adding something sweet offsets much of the spicier ingredients. Some examples of secret ingredients for chili include honey, brown sugar, pickle juice, cornmeal, baking cocoa and many more. 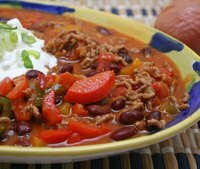 Supplementing your own twist on a basic chili recipe may be a trial and error process, but once you have the right recipe down, you will use it time and time again. Pretty soon, people will be asking you how to make a great pot of chili. Why Add Cocoa Powder to Chili? Cocoa powder adds depths of flavor to chili as well as balancing the richness and sweetness of chili's beans and tomatoes.